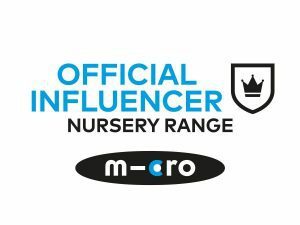 Because we were away last week on holiday and not posting much I’ve not yet shared that we’ve been chosen to be Ambi Toys Ambassadors! I say we, but really it’s Arlo and Athena who will be putting toys through their paces! You can meet the rest of the Ambi Toys ambassadors here. Ambi is a new range of toys from Galt designed to suit babies from birth upwards. I love their classic designs and bright and bold colours. The toys are designed to help little minds discover the world around them, and ranges from rattles to bath toys, and they’re well made from baby-safe plastic so no worries about them being chewed on or dropped in the bath! I let Athena choose the first toy, and not surprisingly she pointed at the Duck Family on my laptop screen! She is very into birds at the moment and likes to quack when she sees them, so having a new duck family to play with at bath time was clearly a good idea in her mind! There is a large mother duck and three little ducklings, all in bold and bright primary colours. The mother ducks wings lift up so that her ducklings can be stored safely inside when not swimming around in the tub! Each duck has a swivelling neck too, and Athena is pretty keen on twisting them round and round! However her favourite ducky-activity is to line them up on the side of the bath and then flick them into the water shouting ‘Quack Quack Splash Splash!’ as she does it! From a parent point of view I love that they’re not going to go mouldy inside like the traditional rubber ducks tend to do, and the fact that they dry quickly and can be stored in the large duck is a definite bonus! We’ve also had them out in the living room too so they’re not just confined to the bathroom! At the price of £10.99 you’re getting a toy that will last years, and although Arlo is a bit small right now I know that once he’s sitting up in the bath he’ll be happy to join in too! You can view the full range of Ambi Toys on their website, and check out their facebook and twitter accounts for news and special offers!